0 Comments Published by KL Ocs Kid on Thursday, August 30, 2007 at 12:09 PM. 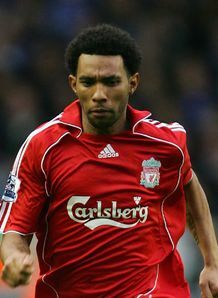 Jermaine Pennant knows he will always have to fight for a place in the Liverpool starting XI and is delighted with his form in the opening weeks of the new season. Rafael Benitez has a strong squad at his disposal and is well known for his rotation policy as the Reds chase silverware at home and abroad. Pennant, who moved to Anfield from Birmingham last summer, has started all three of the club's Premier League games so far this season but did not feature in the UEFA Champions League clashes with Toulouse. And the winger told the Liverpool Daily Post: "Rafa wants everyone to fight to play in every game, and that's what I'm going to do. "Now I'm playing week in, week out, I know what I've got to do to stay there because there is a lot of competition waiting, like Yossi (Benayoun). "I've started the season exactly how I wanted. I needed to continue my form from the end of last season and take it into every game. With the team playing well, it means it's easier for me to show what I can do." He added: "It was my first season at the club last season so I didn't expect to be first choice straight away, especially with Stevie (Gerrard) being used a lot on the right. "I'm sure the manager was looking at me throughout last season to see how my attitude was and if I could handle it at Liverpool. "By the time of the Champions League final, when the manager started me, I felt it proved why he bought me and showed he believed in what I could bring to the team."